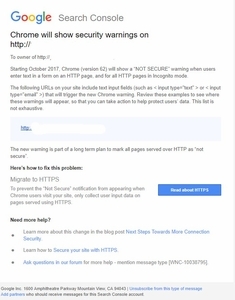 You may have received an email from Google about upcoming changes to Google Chrome that will make your website display as "NOT SECURE" if you do not upgrade to an SSL. Yahoo! will be launching an SSL service prior to October, but it is important to realize that your website will NOT be in full compliance with SSL if you have unsecured scripts or images on your site. If your scripts and images are not compliant, even if you have SSL installed on your website, your website will still throw "NOT SECURE" errors. We've created an SSL Website Cleanup service where we will go through your entire website with a "fine tooth comb", and find every script and image which may result in your website throwing a "NOT SECURE" error. Important Note - Yahoo's standard legacy search will not be compliant for SSL. If you are using legacy search, we will present you with options for SSL compliance. If your website is running any third party product such as King Webmaster or Practical Data, you may wish to contact them in advance to notify them that you have started the process of becoming SSL compliant as there are issues on their end that must also be addressed.